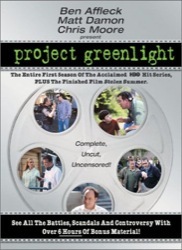 Should the desire to go to film school ever seize you, buy this 4 disc CD set instead. You’ll learn about as much and saved many thousands of dollars. HBO sponsored a contest where the newbie winner — selected from 10,000 entrants after intense auditions — gets to direct and film their first-time screenplay. Of course HBO gets to film *them* as they thrash and burn. Naturally the documentary about the making of is better than the first time film, called Stolen Summer, also included. (I actually liked it.) There’s plenty of drama in the 13-part “making of it” — back-stabbing, flameouts, hysteria, betrayals, and the uncertainty of whether the final film will be watchable. As a bonus, after 10 hours of this insider’s view, you’ll know how films are really made, and you’ll be certain you could do better.